Missing features on 7.5 minute topo maps? As Mike pointed out, there are also issues of naming (Long Meadow versus Ferguson Meadow), but I'm curious who has come across other somewhat egregious oversights on the maps? Re: Missing features on 7.5 minute topo maps? A lot of mapping now is done by computers off of air photos or satellite images. If a stream does not show up on these, it may not get put on a map, unless someone "ground truths" the map. Maps produced in the 1970's are, in my opinion, better, in that they did a lot more ground truthing and actual cartographers made the maps, or at least looked them over good. A good cartographer can take a grid of elevations that are obtained from other means (such as radar) and knowing the geology of the area and with good air photo pairs, interpolate between points based on landforms instead of simply "smoothing" the topography, which is what is more often done nowadays. The USGS also used to be better funded than it is now. When I worked at NOLS in the late 1960's and early 1970's we were given the old "blue line" provisional maps and then were asked to verify features. Each course leader would have a map and we would write notes on them. This "ground truthing" was then sent back to the USGS. I also suspect there are set "criteria" for a feature to be put on a map, such as, a stream has to have a certain length. That creek into Colby may not meet the USGS criteria. Actually, I think it is even hard to see on your photo, although you can extrapolate that the vegetation has to be supported by a stream. It apparently gets lost as it enters the talus. Maybe it has to reach the lake above ground to be put on the map. Depending on the age of a map, a lot of "lakes" on older maps, have now been filled in and are swamps or meadows. Definitely do not trust any "trails" on USGS maps. The forest service maps, although not nearly the resolution of USGS maps, show the maintained trails. So many of the trails shown on older USGS maps have not been maintained, and are now effectively gone. My biggest surprises with streams shown on USGS maps are that late season, a stream can get so low that it is hidden (and water is actually not accessible) in talus. I recall reaching Kendrick Creek in Yosemite, dying of thirst, and hearing the water but not being able to see it or get it! Streams can also sometimes change courses over time. But on a whole, I think the USGS maps are quite good and accurate. The most egregious omission I can think of is on the Mt. Silliman quadrangle. Where Silliman Creek forks towards Silliman Lake and Little Lakes only the branch towards Silliman Lake is shown. I went up the drainage to Little Lakes in early 2017, and there were swimming holes in that creek with head high water for Christ's sake! That same quadrangle also shows a non-existent lake right by JO Pass. On the map it looks like a lake comparable in size to the Sheep Camp Lakes, but in reality it's just a meadow, and a fairly dry one at that. For some reason this used to be one of the select few "lakes" included on the SEKI park brochure map. When I was still brand new to the Sierra and was a complete idiot as opposed to the partial idiot I am now, I set off from Lodgepole to Jennie Lake on a day hike with that park brochure as my only guide. I aimlessly wandered off trail looking for that "lake" only to get hopelessly lost in the backwater of the Jennie Lakes Wilderness. It was my first experience with x-country hiking, albeit under stressful circumstances, but I was hooked. Therefore that lake/meadow has always held a special place in my heart. I did a lot of remote sensing work with my master's thesis (using remote sensing to classify land for water resource modeling). That was in the mid 1990's and at that time, even at best, remote sensing was able to hit about 75% correct. You have to go out in the field, called "ground truthing" to bring it up to closer to 90% . But you cannot ground truth everything so occasional errors are inevitable. Remote data is now much better and of better resolution (for example, Google Earth), but as we who have studied Google Earth know, there still are errors. Shadows are a huge problem for visible light remote sensing. Shadows block a full signal. A round shadow can easily be misinterpreted as a lake. I also think streams that run through trees (lots of shadows) are difficult to identify on a remote image. Features that face north have more shadows. But, as you say, if it was on the 15-minute map and not on the 7.5 minute map, that sounds like a simple error on the part of the cartographer in charge of that map. There is plenty of technology out there to make more accurate maps, but it all costs and funding for the USGS is dismal nowadays. Private companies, such as Google, have now pretty much taken over a lot of that work. I am sure the military have better maps, but not for the general public. Creekfeet, we've eaten lunch at that lake near JO Pass...it did have a tiny bit of open water when we were there in July a few years ago...but it's mainly a meadow. Definitely do not trust any "trails" on USGS maps. The forest service maps, although not nearly the resolution of USGS maps, show the maintained trails. So many of the trails shown on older USGS maps have not been maintained, and are now effectively gone. There is a lake south from Purple Lake, below JMT, before the pass to Lake Virginia. It is not on the map. It is clearly visible from the trail, with plenty of water even in late October. See satellite photo. Yes, this is absolutely the case. Trails come and go, and their routes sometimes shift a bit. Natural features, particularly water related, change as well. There are a lot of year round snowfields/small glaciers on my old 15 minute maps from the 40s and 50s that surely don't exist any more. And the blue lines representing year round water coming out of them aren't there any more either. Tree lines are shifting too. USGS maps have always had limitations as others herein have noted. Outside of ground truthing, they had to rely on whatever was captured during aerial camera work that may not have shown much. Trying to make sense out where streams and small lakes are is not always obvious on the old black and white satellite imagery. I've come across many streams that are drawn incorrectly much less trails haha. There are rather large during early summer rivers in the Sierra Nevada that by fall are often bone dry. It would be interesting to have a map showing all permanent streams in the range and differentiate them from the many more that sometimes dry up. And of such streams that dry up, there may be sections where one can count on resurfacing even at driest times due to underground reservoirs along drainages of slowly seeping out water. I took the image of this lake in late September that is not on the old 15' or current 7.5' maps. 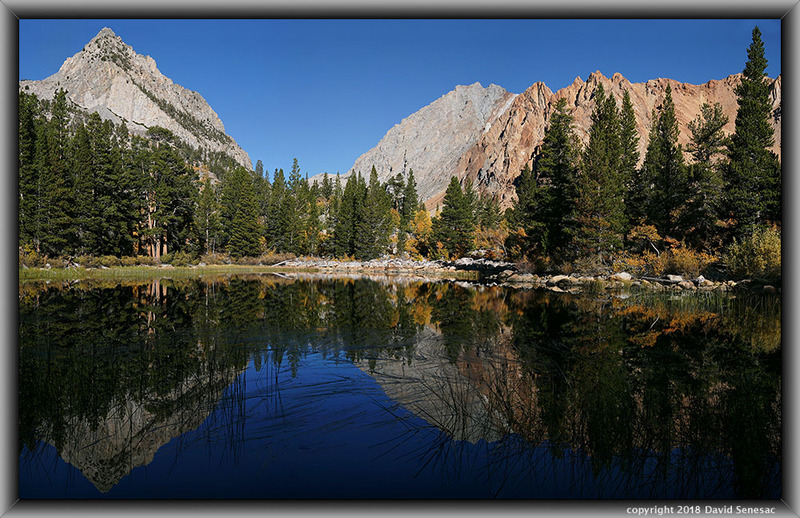 It is a shallow lake that I'd better describe as a pond with an all year water source of Mt Lamarck snowfields. There are a great many shallow ponds in the range that are not on maps because most don't last through average summers, much less after dry winters. On topos, are lakes shown as marshes and also ephemeral dry lakes. I suspect cartographers expect most shallow ponds without obvious permanent streams will go dry thus do not show them as ephemeral unless they are large. In like manner, it is difficult to assess whether some streams are likely to go dry though I have considerable skill at guessing where I will find stream water by merely studying topos, satellite imagery, and geological maps. For instance, large fields of north facing steep talus are often full of ice well below surfaces that will seep out water even after driest winters. One can identify such seeping on satellite maps because of identifiable lush vegetation features at bottom outflows. And certain geologies like volcanic soils hold water far more than impermeable rock like granite. Much more for a perceptive enthusiast to understand.